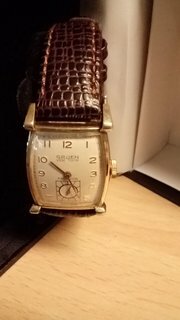 Very thin 1940's Gruen Watch, in perfect working order. 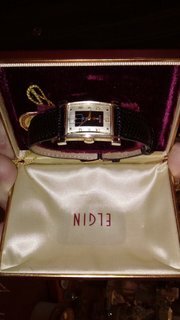 Lord Elgin Men's Art Deco Watch in original box in perfect working order. 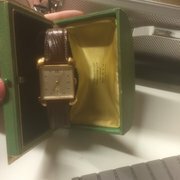 1930's Lord Elgin Mens wrist watch, perfect condition in original box. Art Deco Orator Swiss watch 1930 in its original box and in " mint condition " would make a different Stunning Xmas present for that special someone in your life. 12 months warranty on all our watches. 1948 Bulova His Excellency 'NN' . Lovely Chain mail Bracelet. 1940 Bulova 'Engineer' Mint. Very Rare. 1949 Bulova His Excellency 'NN' White Gold, Charcoal Face. 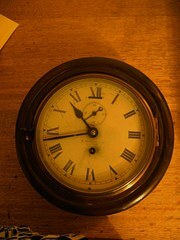 Mahogany cased ships clock,by F.Pearson & co Newport. Black slate mantel clock with malachite detail. 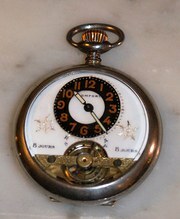 Superb vintage 8 day swiss pocket watch with enamel face and visible escapement. Fully serviced.. Face is in excellent conditon with no visible flaws. Beautiful brass clock cica 1910. French made possibly in Paris. Lovely clean face and immaculate condition. Fully serviced timepiece. Maker unknown as clock is unmarked.